India has become the biggest importer of Chinese solar products in 2017 accounting for almost 25% of all Chinese solar exports and its biggest market. Despite over a hundred manufactures of solar panels, the Indian solar manufacturing industry continues to be in ICU as it is unable to compete on costs and subsidies given to the Chinese companies. 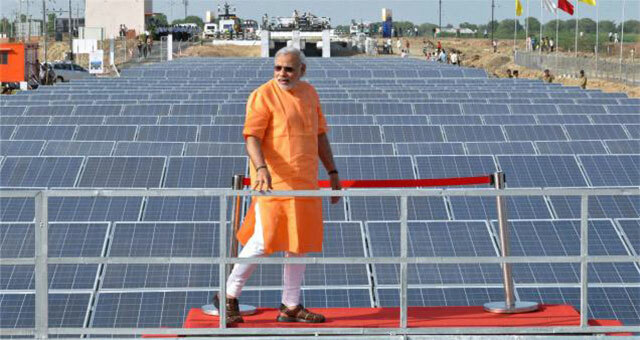 Despite being in the solar business for a long time, the Indian companies have failed to develop partly due to the haphazard government policies which have failed to support the industry. Even as Chinese exports to the USA and European markets have fallen to single digit levels due to safeguard duties and anti-dumping duties, Indian imports have continued to rise at triple-digit rates. The Indian government has kept coming out with draft policies to support domestic manufacturing but failed to implement any of them. Even the most recent safeguard duty which has been prescribed is stuck in bureaucratic red tape and courts. Without a holistic planning structure, the Indian industry has struggled against continuously rising imports which accounted for over 90% of the Indian domestic market. Most manufacturers are running at low capacity or have stopped production altogether. With new technologies and massive scale. Some Chinese solar companies have singly got the solar capacity of the entire Indian industry now, it is perhaps too late to support the Indian industry. Like oil, India may become completely dependent on imports of this new energy which is set to dominate the future. USA has recently come out with a further trade remedy to stop rising imports from China and its proxies in SE Asia which could lead to a manufacturing getting a lifeline in the USA. But in case of India, this may not happen as the government keeps dithering on what to do despite the DCR also being removed due to WTO complaint by the USA. Even as India grows more ambitious each day in its solar and renewable energy targets, its manufacturing ability languishes. India has become the 3rd largest market in the world for solar energy with almost 9 GW of demand in 2017, however, the country has failed to become an industry leader and create the adequate ecosystem of jobs, technology. A drastic overhaul is needed for India to become a major producer of solar products unless which India will remain a big importer of solar products. China’s exports of solar wafers, cells and PV modules totaled US$13.11 billion in 2017, with India being the largest market accounting for 24.1%, Japan for 14.8%, and South Korea, Taiwan, Malaysia, the US, Australia, Mexico, Thailand and Brazil each for 3-7%, according to China Photovoltaic Industry Association (CPIA).